The Barley Way from Amir Avni on Vimeo. One of the biggest influences on the drawing style of "The Barley Way" was comic strip artist Floyd Gottfredson. I first became aware of his work while volunteering at the ASIFA-Hollywood Animation Archive. In the beginning of my 4th year at Sheridan, I talked about Gottfredson's work with Mark Mayerson, he kindly offered to share his collection of Gottfredson strips with me. But uses in the film itself were more subtle. I was fascinated with how Gottfredson sometimes draws the overall shape of two limbs as if they were one limb, I marvelled at how it created an appealing silhouette. 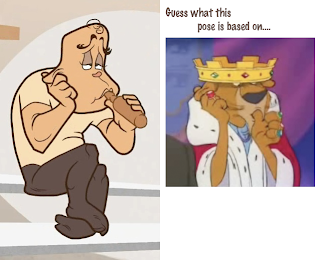 I tried to apply this principle in original poses that weren't taken from his comic strips. By the way did anyone catch the homages to science? In the picture above, Beanton unfolds Stephen Hawking's black hole entropy equation, just one scene later, the telescope interface shows the name of a nebula near which alcohol clouds sufficient to make 400 trillion pints of beer can be found-- I learned about the former from my classmate Tanya. 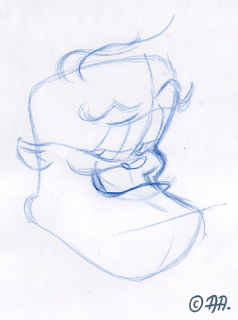 BTW, Beanton's first level of forms is influenced by a baby Swan from Bob Clampett's "A Corny Concerto". Influences from the Looney Tunes realm will be explored in a separate post. 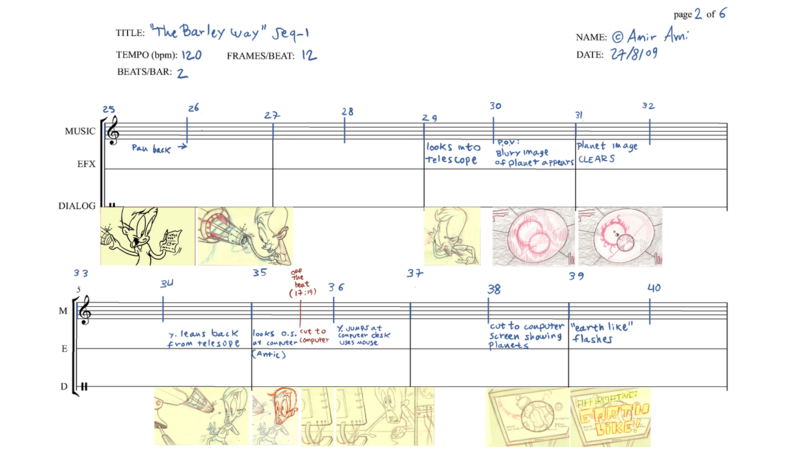 This post continues exploring the research made in preparation for my film "The Barley Way". 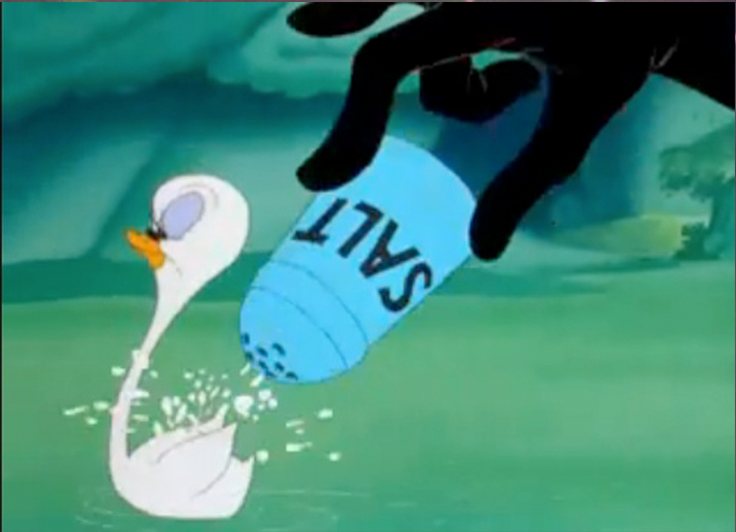 The influences in this film weren't used in a way of direct replication. While watching and re-watching a great number of cartoons for the combined joy of entertainment and study, I've come across elements that stood out to me as especially great. These elements were studied and integrated into the film in a way that complied with my needs of production and aesthetic goals. 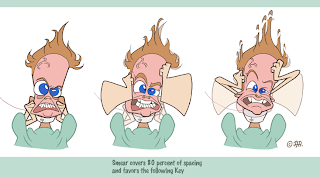 This post will examine elements of design and animation with emphasis on the Looney Tunes realm as well as other related sources of influence. 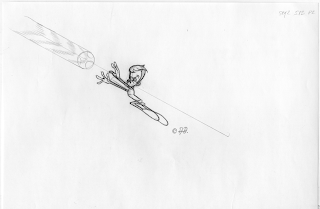 I do not contend to be on the same level as the animation greats I am influenced by, the purpose of the post is not to make that kind of value judgment, the purpose is to do what the title says: explore more influences on the film, focusing on animation and design. After seeing this film, Tom Minton has said that my "Intense study of Avery's timing and Scribner's distinctive animation is paying off". I was excited beyond words that such a wonderful artist recognized what I've studied, and appreciated it. 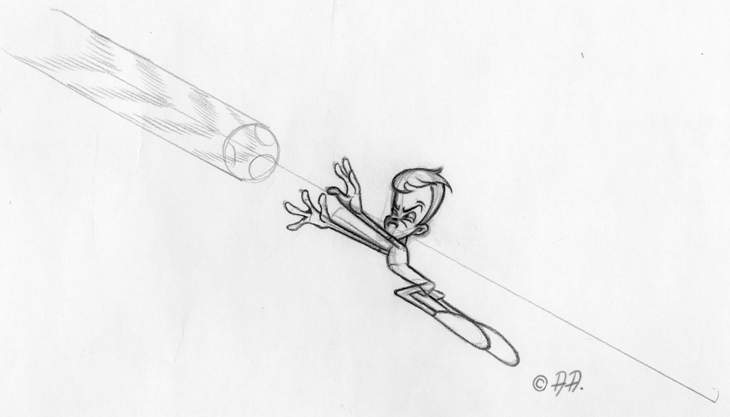 I've been fascinated with Rod Scribner's animation for years, and have spent many hours freeze-framing his scenes. Scribner's inventive spacing is unparalleled in the world of animation, his ability to make seemingly irrational drawing choices that read so smoothly when animated is nothing short of brilliant. I heard from a very reliable source that Scribner used to draw from the sports page, those images portray incredible energy locked in one frame. 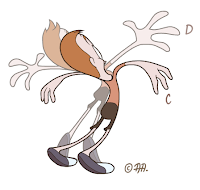 The exclamation poses are very unique, the body doesn't simply stretch, rather the characters stand on their toes, stretching the legs and pushing the rest of the body diagonally upwards, then a curve starts from the hip area and arches the spine outwards, with the ribcage raised. 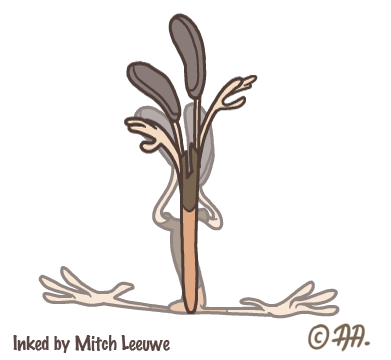 I used this exclamation pose in a 3/4 back view, which I haven't seen done before. Scribner's full animation often shows the exclamation extending upwards until resuming a more neutral pose. 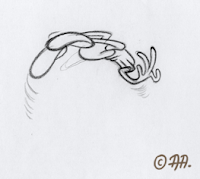 In order to allow for more held-cel time in my film, I went for an overshoot, especially on the hands and head, with slighter changes in spacing on the rest of the body, and then settle in a way that preserves the energy of the pose. I'm influenced by the way Scribner draws hands and distorted poses that are bent in a limber way. But Scribner wasn't the only influence in this scene, A few frames after the drawing discussed above, I took note from Richard Williams' retelling of Ken Harris' advice, that a speeding character should stretch in the last frame before hitting a hard surface. 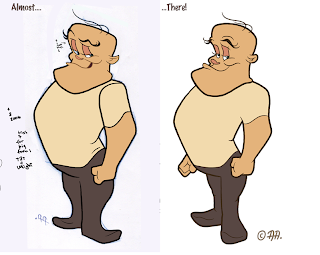 In a previous post, I noted Floyd Gottfredson's influence for the pose leading to those discussed above. Here Beanton's limbs are designed to form a single unified shape, the same way Gottfredson treats Mickey's limbs. Often one pose was influenced by multiple artists, sometimes I looked at various sources before drawing a pose, and sometimes the mental image of influential characters just went through my head while drawing, as in the case of this pose: The alien girl was influenced by Scribner's Coal Black, especially for facial expression and the construction of the body. 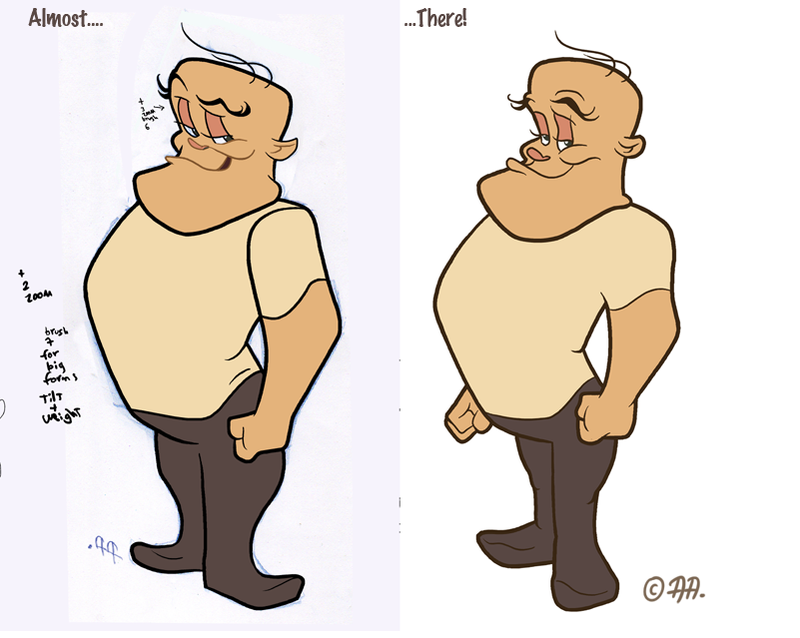 The overall pose: line of action, gesture and limbs were also influenced by Floyd Gottfredson. As you can see, this is not direct replication, rather the study of inspiring artists and the identification of their principles and trademarks affects my work. sometimes consciously as in the case of problem solving, and sometimes subconsciously as in the case of the pose above. 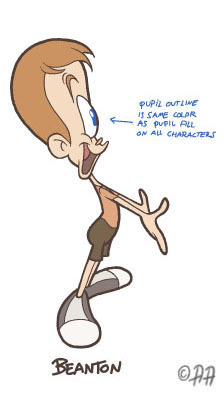 After years of watching Warner's cartoons, I've looked for a way to follow their wild "takes" in a way that complied with my production needs, those of advanced limited animation. Bobe Cannon's smears cover about 60-80% of the spacing between Key 1 and Key 2, favoring Key 2. This result in a very smooth transition. I applied these observations to my own scenes. 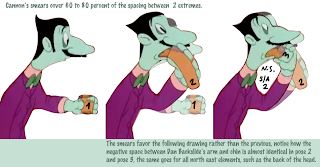 Cannon has also animated scenes where the smeared drawings last more than one frame, in those instances, the first smear also covers about 60% of the spacing gap, the following drawings are spaced closer to Key 2 and the trail leading from Key 1 shortens. This smear covers about 90 percent of the spacing between the poses. Another way to handle pose C is gapped spacing, and also very stretched poses which incorporate some smearing on select parts of the character, later I noticed that Clampett's animators also used that method, note the dog's hand. 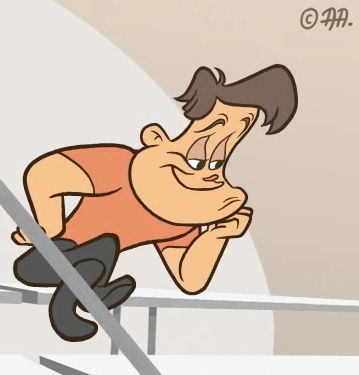 The Warners' cartoons have also influenced me in terms of facial expressions, Some of my favourite cartoonists, such as Pete Emslie, Joe Haidar and Scott Shaw noticed that I used Chuck Jones expressions in a few deliberate moments. 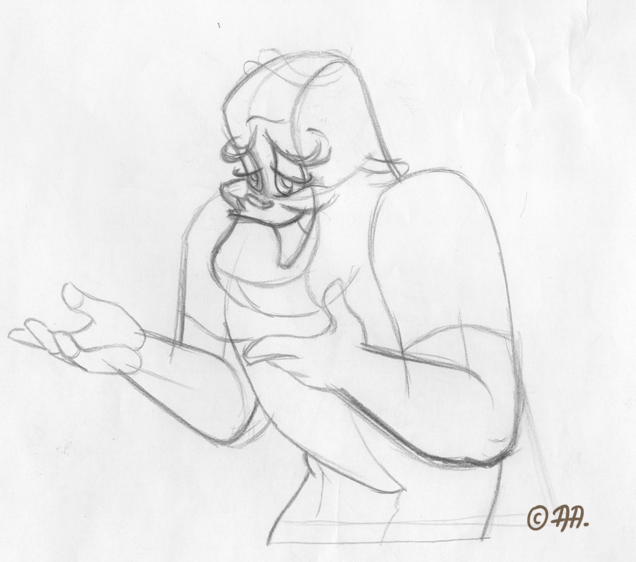 These expressions weren't copied from specific frames in Chuck Jones' cartoons, rather they resulted from watching many of his cartoons, they were drawn from the accumulation of memory and feeling, and used to reflect on the mental state of the characters in a humorous way. Below is an outburst of Joy resulting from epiphany: "Dad's always been proud of me! I can put my previous thoughts about his perceptions of me in the bin!" 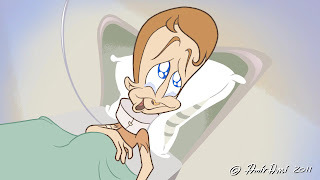 The likeness to Jones' expressions is achieved in a way of graphic design: teardrop shaped eyes with thin pointed tops, round bottoms and long curling lashes. The mouth also follows a curved "V" shape on a big smile, and more of an "L" shape on a moderate smile. The cheeks resemble a feather shape. Jones sometimes used slight changes of expression on the mouth and / or on the eyes to go for a laugh. In this scene from "Rabbit Seasoning", Daffy Duck sours at the sight of Bugs Bunny winning and fooling Elmer Fudd. Only the face moves while everything else is frozen. The sound effect of the protruding tongue really sells the gag. I tried the same thing here: Jossefat is upset that his brother has succeeded in gaining dad's favorable attention. Only the mouth moves to a sneer, followed by the sound effect of a growling tiger. Believe it or not, some poses and expressions were even based on Disney cartoons! Most other expressions were drawn from the mirror and a few from the mind's eye. 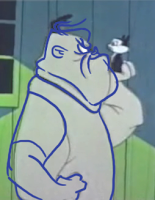 Chuck Jones' lummoxes and dogs also influenced the design of the Dad character. In the beginning, both Dad and Joseffat were constructed from rubber hoses, but that lead to confusion among viewers. 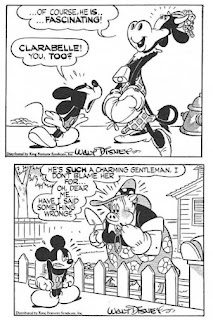 Look at the legs, that's Gottfredson again! The characters were designed to look distinctive by their silhouette and construction alone, surface detail was kept to a minimum, that is the 60's gift to production: saving on pencil mileage. 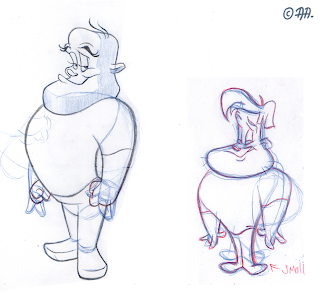 Inspiration for the heads also came from my friend Brock Gallagher who sometimes draws no neck for his characters. While doing cleanup on his fabulous film "The Peasant and the Root", I saw how much agility that design choice gave his characters, I decided to apply that design to my own characters as well. 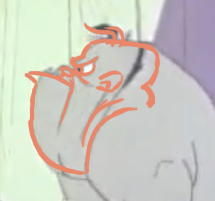 Brock was also the voice of Jossefat, I could have never found another actor with so much energy and inner cartooniness. The same goes for the great Pete Emslie, who's voice really helped develop the character of the Dad. 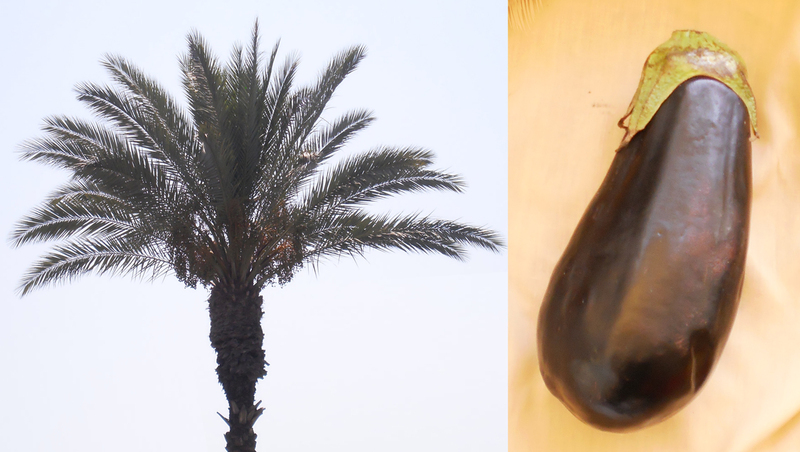 Jossefat's head is a hybrid between a palm tree and an eggplant. The purpose was to come up with a pompous shape that is also funny and appealing. 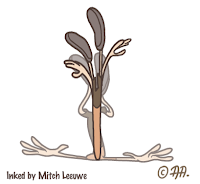 Some people have recognized the micro-gag in Sequence 3 where he is juxtaposed with a vase of flowers in the shape of his head. 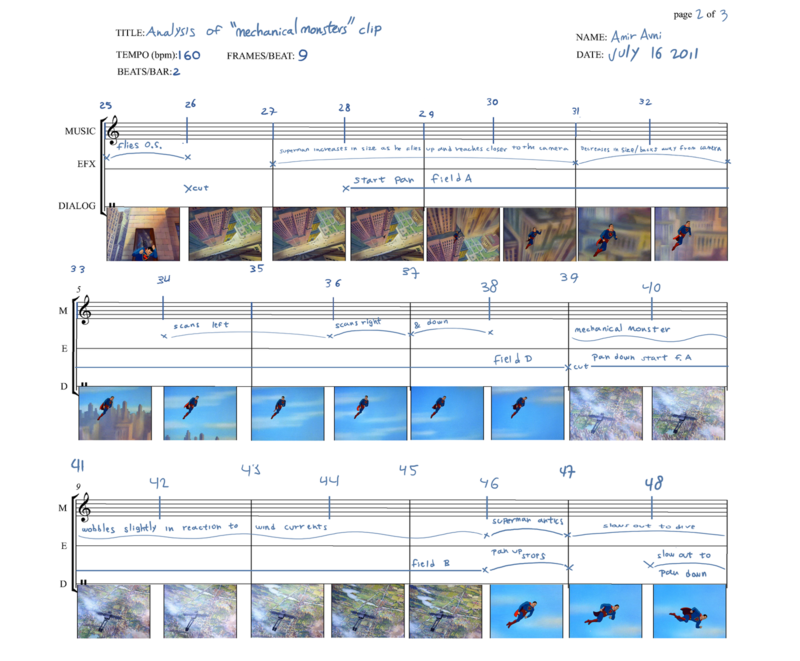 This has been a summary of some of my favorite components of animation and design in the film, it was a list of observations from a variety of sources and a discussion of their application in a way that is compatible with the production needs and aesthetic goals of the film. In future posts I will discuss musical timing and story. I've always been fascinated with musically timed cartoons. From the precise synchronization of all the elements of individual character actions, gags and special effects to the pacing and flow of the entire film. 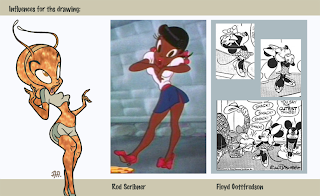 I have always found that 1940s cartoons are stylistically and methodically different than those produced today. As the expression goes, “They don't make them like they used to”. When making a personal film from beginning to end, for the first time at Sheridan College, the problem of timing and pacing first occurred to me in a practical sense, I wanted to “make them like they used to” but didn't know how to go about doing so. 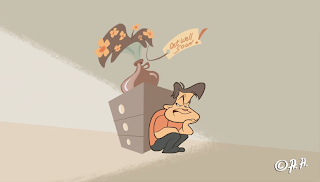 When volunteering at the ASIFA Hollywood Animation Archive, Director Stephen Worth commented that the timing of many student films feels unplanned because of their methodology. 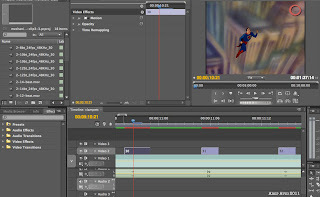 Many students use editing software to time their films by their gut feeling, action-by-action, or in the case of a dialogue heavy film, they time according to the dialogue tracks. As a result of this methodology, the film feels unplanned. Steve then demonstrated how a 1960s Tony the Tiger commercial was timed by explaining the Bar Sheets and Exposure Sheets on which they were timed. Demonstrations such as these, as well as material and tips from Sheridan instructors such as Mark Mayerson who introduced the class to metronomes and recording methods, Bruno Degazio who introduced the class to bar sheets and designed the template, and the blog of Disney historian and animation director Hans Perk inspired me and gave me a direction to further explore the pieces of this puzzle. After exposing myself to such lessons for about 2 years the penny dropped, I reached a functional understanding of the basic principles of beat timing and I used it to time The Barley Way. The film is timed to the beat from beginning to end. 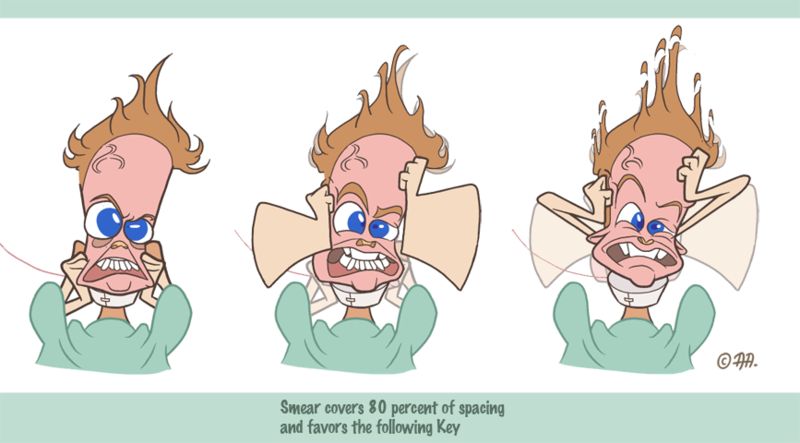 Here is a breakdown of a few simple scenes via the animatic and bar sheets. 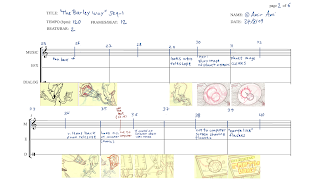 The storyboard drawings were timed according to the beats. Fortunatley, the melody accents also strictly adhere to the beat in this segment of Dvorak's "New World Symphony". 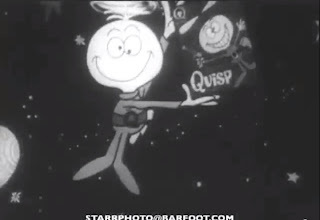 This helped create the "Mickey Mousing" gag of the "Earth Like" text appearing and disappearing to the melody accents, when writing the bar sheet, I alternated the beats: Beat 1: appear, Beat 2: disappear. 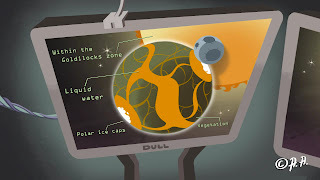 Viewers such as Steven Bellettini realized that using Dvorak's "New World Symphony" as the soundtrack for the discovery of an earth-like planet is a Musical pun. There's various levels of micro-gags in this film. Some people have noticed the "Mickey Mousing" gag, and some have noticed that Beanton's computer screen is manufactured by "Dull". My penny dropped, so I wanted to share my 2 cents with you. 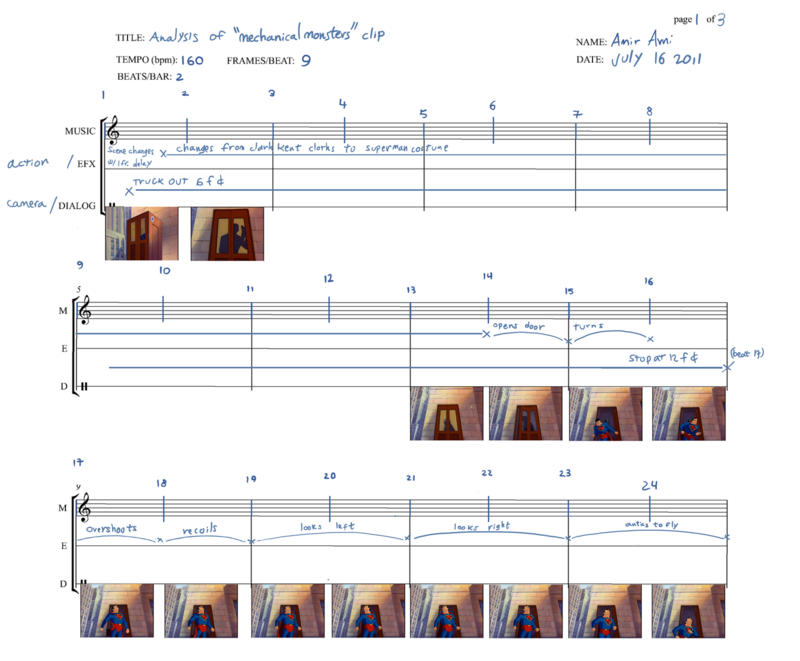 It finally clicked in my mind: how to record click tracks, use them to time animatics, and following to write bar-sheets / x-sheets / timing charts. On a Mac I turn up the volume and record a sound clip in Quicktime. On a PC, Mark taught us to enable internal recording: go to Windows sound properties > master volume properties >; switch on "recording". Use Windows sound recorder (accessories > media > sound recorder) to record a minute's worth of each beat. and voila! you have a click track. Save each track by it's name (8beat, 10 beat etc..) so that it's ready to import to Adobe Premiere. Determine the mood and speed of your scene / determine what situation/mood your character is in. After determining the mood, import the proper click track to your timeline ( in Premiere ), and line up your storyboard drawings and character poses so that they happen on the beat. It's way better to do this than to guesstimate your timing based on a sequence of stills (It would almost always be too slow, and doesn't give you a clue on how to write a bar-sheet or x-sheet). Steve mentioned that an animatic should seem 20% faster than the desired final result. This makes a lot of sense, I remember reading Joe Adamson’s interview with Tex Avery in Tex Avery King of Cartoons, Tex refers to the colored cartoon as a “solid”. 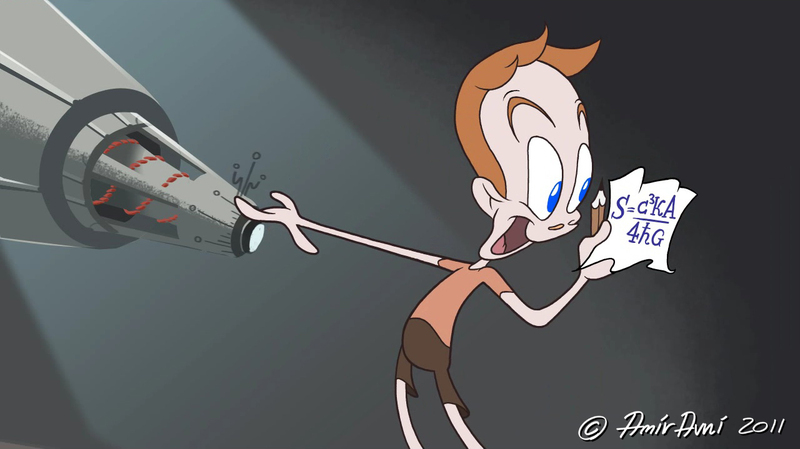 The cartoon is much easier/ faster to read when animated and colored. 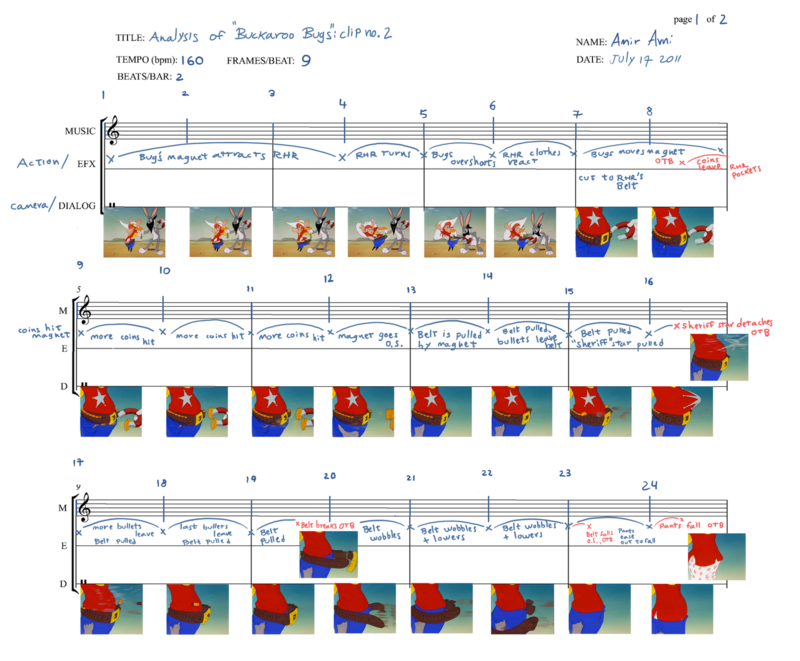 A sequence of stills takes longer to process than animated, colored drawings. Working to a click track makes it possible to do musical timing before you have any music, you just need to get music that follows the same tempo as planned. Music allows you to go even faster because of it's engaging / telegraphing nature, a musical beat functions as a heartbeat, the audience feels the beats and expects things to happen on them. You can reach a shock / surprise when actions happen off the beat, because it plays with the audience's expectations. Steve's example: "ta-da ta-da ta-dadada....pop! goes the weasel!" If your action happens on the "pop!" it is expected. If your action happens before the pop, it is unexpected. How it works: A bar is a measure of 4 beats. 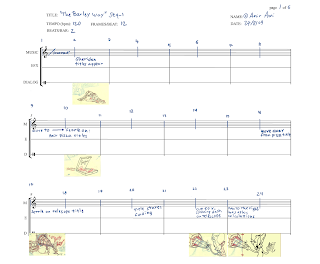 The first beat is marked by the border-line of the bar, and we indicate the following 3 with drawn-in pencil lines. I chose to divide each bar to 2 beats so I can work in greater detail. 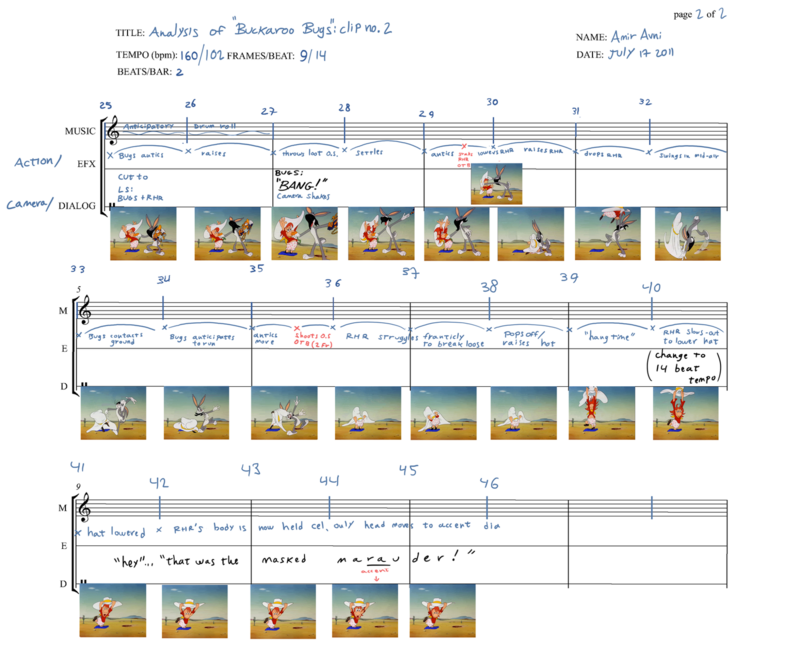 Based on your animatic, count your beats, and number them on your Bar sheet. On the Bar sheet, note/draw the action each beat describes. 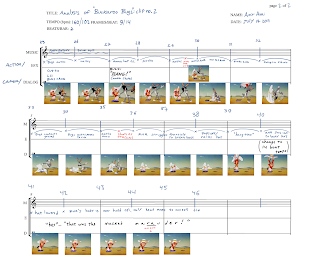 I placed thumbnails of my storyboard drawings below the beat that describes them in Photoshop, and wrote descriptions of the actions relating to beat numbers. Working on 24 fps, transcribe the bar sheet information to an X sheet. If your scene is timed on a 9 beat, mark a beat on every 9th line of the X sheet. It's good to number each beat on the bar sheets and X sheets so that you know exactly where you are. You now know exactly how many frames are needed for each action to take place. My further studies of musical timing are explained in "Musical Timing 2: From the Master's Thesis Project"
Although I was happy with the musical timing in my film, I was still unsatisfied, I knew there was more to learn. This lead me to further study timing methods for my Master’s thesis project. 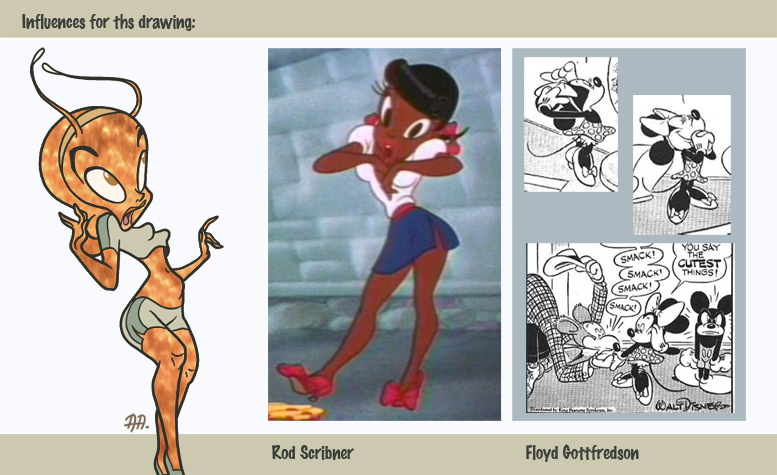 Below are three examples from my project, analyzing two 1940s cartoons. Bob Clampett’s Buckaroo Bugs and Dave Fleischer’s Mechanical Monsters. I started by analyzing the tempo of the clips by tapping my hand to the beat and trying out various click tracks in Adobe Premiere. 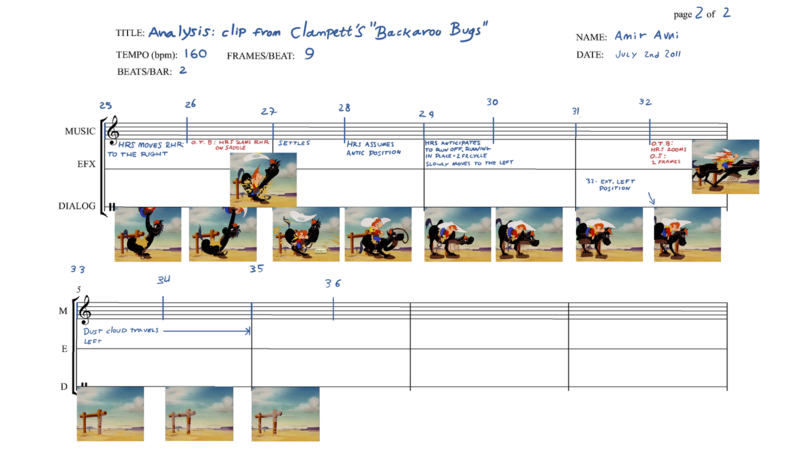 After matching the clips with the right tempos, I made graphic note whenever the beats hit. Inspired by Hans Perk, I used Photoshop to make the red beat symbol circles. 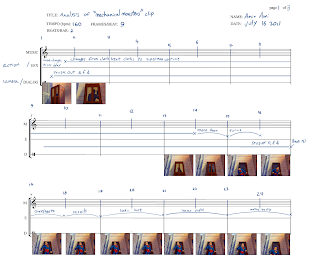 I cut and pasted them whenever a beat hit (as seen in the soundtrack layer of the screenshot above) and numbered each beat. Numbering the beats is essential to writing the information on Bar Sheets. There are many noteworthy elements about the first clip, the strict adherence of most actions to this tempo creates an upbeat uniformity, except with the deliberate intension of surprising gags and action which demand particular attention. The Horse's “eye poke” for example, is placed off the beat (OTB) for surprise. The use of percussion instruments and the punching-bag sound effects further mirror the visuals of the punching gag, which follows the eye poke. All through the clip, the build-up, or anticipation take more time than the executed actions themselves. For example, the horse runs in place leaning backwards in anticipation to shoot off screen for 4 beats (36 frames) to deliver great anticipation, and then shoots off the screen in just 2 frames, also off the beat, for greater surprise. 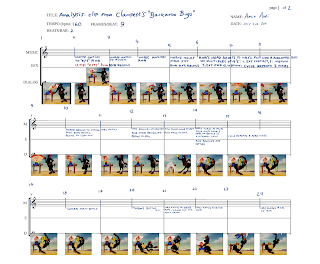 The music of the entire scene is a build-up for the horses' run off the screen, the run off itself is accompanied by the sound effect of a gun shot, to further highlight the visuals. I would like to thank Milton Grey for his time and contribution in the form of discussions via email. It was through his detailed notes that I gained greater expertise at writing exposure sheets. Milt's explanation of how arcs are used in Exposure Sheet form also helped me understand how to write better bar sheets. I feel privileged to have had the input of an animator who started his career on Disney's The Jungle Book, interviewed Looney Tunes director Bob Clampett and composer Carl Stalling. 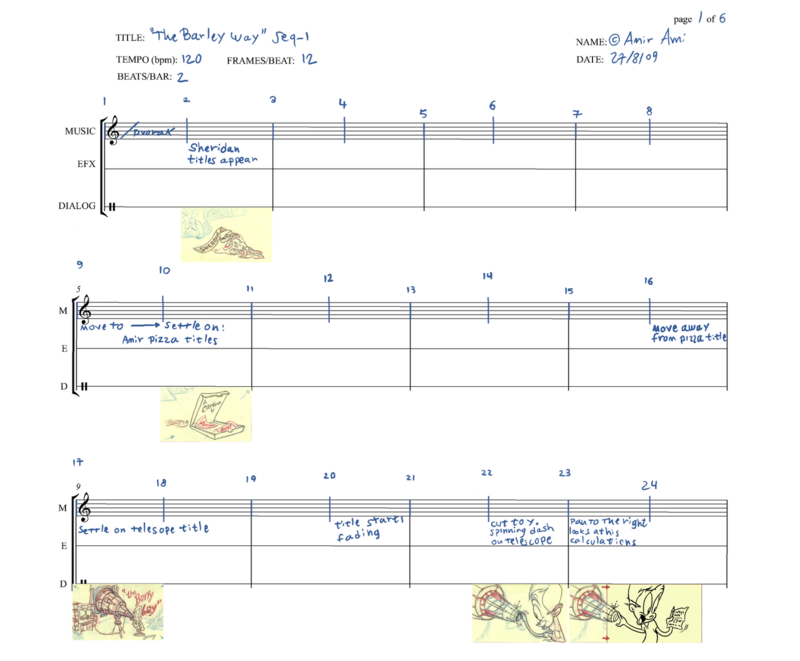 My research and cartooning process are interrelated, Perhaps with resemblance to Friz Freleng, I prefer starting to work on a bar sheet as it provides a visual timeline. Following feedback from Milt, I became better at writing exposure sheets and can now time on them directly. 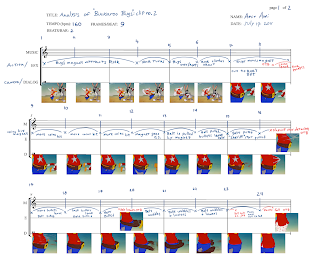 So that, both the music and animation rely on the director's indication of how many bars or frames are assigned for an action to take place. For this clip, as well as the next, I consulted with composer Zvi Avni who helped me further understand the musical elements and identify instruments, Although we share the same last name we are not related. Here, as in the previous clip, there is also more time given to the anticipation of an action and less to its surprising execution. After dropping Red Hot Rider, Bugs swings in mid-air then runs in place for a total of 4 beats, and shoots out of the frame, off the beat, in only 2 frames. 1.The music: the use of percussion instruments, such as xylophone and glockenspiel give a metallic sound, mirroring the visuals of the robbery. 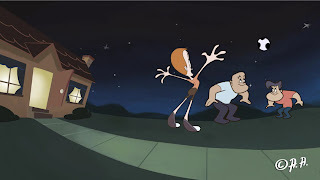 2.Inventive animation: such as the wobbling of the belt and the slowing-out of the pants before falling are signs of an intelligent animator using everything he's got to maximize the gag, lesser animators would have just used even inbetweens. Even though there is plenty of anticipation to gags such as the detachment of the Sheriff star from Red Hot Rider's shirt, the animator maximized the potential of the gag by using special effects to further sell “the after effect” of the gag. Knowing that the eye needs a certain amount of frames to adjust to an action, the animator and ink-and-paint assistant used a dry-brush effect in the shape and color of the star close to where it was just a frame ago, it takes several more frames until the dry-brush effect completely dissipates. The dry brush effect is achieved by smearing the leftover paint of a brush on the cel, without wetting it in water to make the paint look smooth. 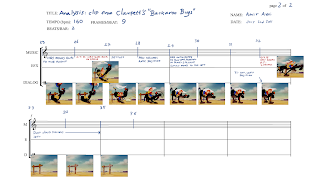 And all this is done to the musical timing framework, which gives each action calculated and thoughtful placement, resulting in a film with a more precise execution. 3.The camera: shaking in unpredictable ways to mirror the yelling action. And all this is done faithfully adhering to the beat. It is very important to note that in this clip, different tempos reflect the mindsets and mannerisms of different characters. Bugs is on a 9 beat to reflect the slyness of his character and Red Hot Rider is on a 14 beat to reflect the slowness of his character. Although Red Hot Rider also follows the principle of more anticipation and less action, it takes him more time to recover from an action, such as in the slowing out to hold after he has raised his hat. 1.Show them you're gonna do it 2. Do it 3.Show them that you've done it (Williams 2001). Or in other words, there are three parts to an action: Anticipation, Action, Reaction. 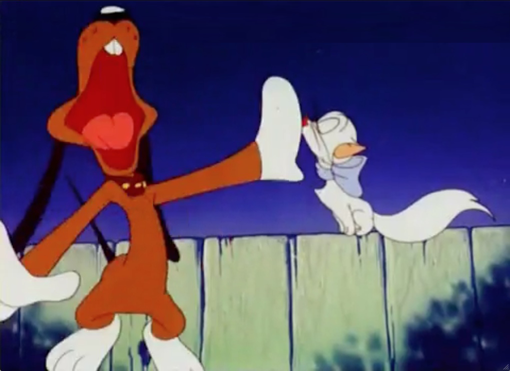 Noteworthy comedians, such as Bob Clampett and his animators, extract the maximum potential of each action part, being mindful of the personality of each individual character. 1. The Music: The sequence, or build-up to the fan-fare Superman theme adds tension and anticipation before the reveal. 2. The Camera: Trucks out in a moderate pace, telegraphing to the viewer that it is worthy to gain space for something bombastic to take place. 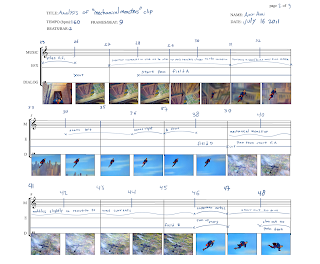 Zvi noted that When Superman is revealed, only the wind trills are heard to give a short “break” before Superman flies up to the sky, and the entire orchestra resumes playing. Zvi noted that the chords are on the beat throughout the entire piece. Changes in instruments and intensity mirror the visuals, which follow the same beats, both were pre-determined by the director Dave Fleischer, and composer Sammy Timberg. 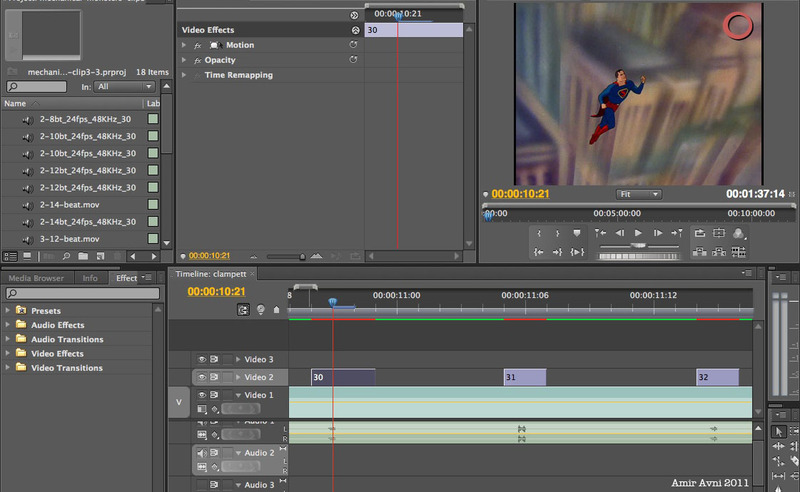 During beat 26 to beat 38, Superman flies upwards to gain greater sight range and look for the Mechanical Monster. Zvi noted that the melody goes chromatically upwards to increase the anticipation, the instruments used reflect the light and confident feel of the character. Beats 39 through 45 follow the Mechanical Monster, which is accompanied by very tense and loud chords, until on beat 46 Superman is revealed and his musical motif returns. When done with technical precision and artistic vision, musical timing harmonizes all the elements of a film into greater cohesion, and maximizes the delivery of the entertainment experience to the audience. It is a logical and precise method to reach a sensational result. 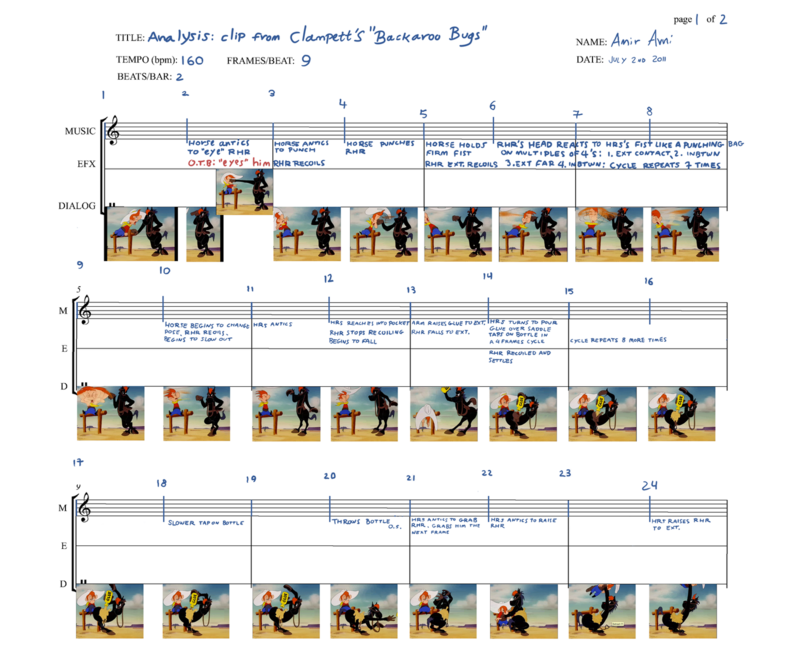 Animation timers can use musical beat timing to control the pacing of the entire film, just as storyboard artists and screenwriters can control story arcs, animation timers can control pacing arcs, deciding on the right pacing for the mood of each sequence and the execution of each action. I hope people will be inspired to use this information in their own work, let's start a cartoon art movement! HOLY SMOKES! That's amazing! I can't believe how much story and emotion you got into two-and-a-half minutes. Bravo, and job well-done! Your intense study of Avery's timing and Scribner's distinctive animation is paying off…In addition to all the hard work, it's nice to find GOOD TASTE on display in a student film. Thoughtful choices in design, color, voices and music. This one's firing on all cylinders. Very very cool Amir! Nice idea, really well done!…you've done a great job with nice timing and strong poses. I'm very impressed! Your cartoon is amazing. Technically stunning, and pretty serious content, well presented... Your dedication is inspiring. The Barley Way © 2011 Amir Avni. Simple theme. Theme images by sololos. Powered by Blogger.